Managing money keeps getting easier and easier thanks to personal finance apps. These apps enable us to budget, remember to pay bills, and keep an eye on account balances among other things. Let’s take a look at three of the most popular personal finance apps today. The Mint app from Intuit Inc. is undoubtedly the best personal finance software for keeping your finances on track. The app helps you get a complete picture of your financial life from account balances, credit score, net worth, among other money matters. This helps you avoid unnecessary loans and debts. This finance app features Mint Bill Pay, which allows you to link your credit cards, bank accounts, and different bills. Through this feature, you can schedule bill payments, set reminders to avoid late payments, and check bills as well as account balances all in one place. Mint has put in place strong security measures to protect its users’ sensitive information. For instance, the app uses multi-factor authentication to protect access to each account. This includes a four-digit user code, using Touch ID and codes sent to the user’s phone number or email address. Mint also uses 128-bit SSL encryption that is verified and monitored by VeriSign. Mint is compatible with both Android and Apple devices. Wally is another widely used expense tracking app. Since its launch in 2013, the app has made an impressive progress (with regards to improvements and the number of users). The best part about this app is that it is absolutely free and comes with no pesky adverts. Just scan your receipts, and Wally will automatically feed and sort all the details of your purchase into categories. This enables you to view how much you’ve spent daily, weekly, or monthly. • Global Currencies – No matter the type of currency you use, Wally allows you to track your expenditures (supports all currencies). • Categories & Aspects – This feature lets you attach a “reason” to every expense. It is an important feature as it allows you to see where the largest part of your monthly budget goes. Wally is available for Android and iPhone. If you are searching for a simplified way of investing your extra cash or a low-cost investing tool, Acorns could be an excellent choice for you. 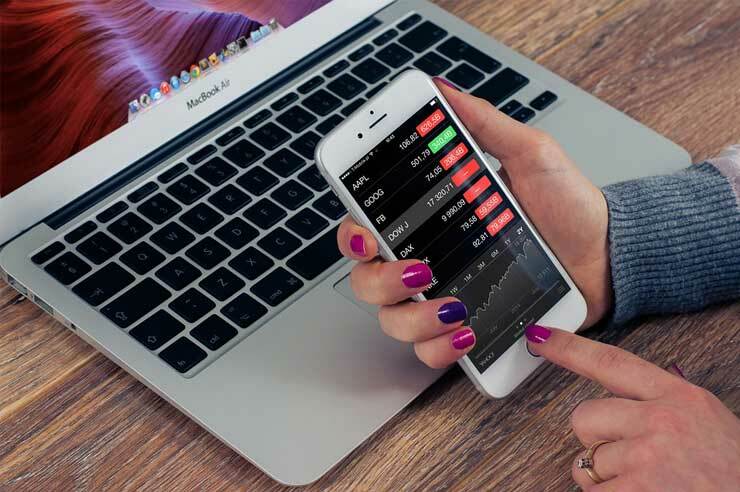 The app links with your credit cards and bank accounts then sums up your daily expenditure and automatically invests your spare change into a diversified portfolio of low-cost exchange-traded funds (ETFs). The main aim of this tool is to create an easy entry into the stock market for younger, new investors while eliminating entry barriers like high fees. Acorns investing app comes with a fee of $1 a month for accounts with less than $5,000 and an annual charge of 0.25% of the account value for accounts with more than $5,000. However, students get to use the app without paying a penny. Both Android and Apple users can download the Acorn app to start their investment journey. Smartphones are now solidly established as a fundamental part of our lives. We use our phones to make purchases regularly. A survey by Accenture showed that 18% of North Americans use mobile payments frequently. Therefore, it makes perfect sense to use our mobile devices to manage our finances.